This app offers you an amazing way to explore and learn about some of the ethical issues of using social media in social work. 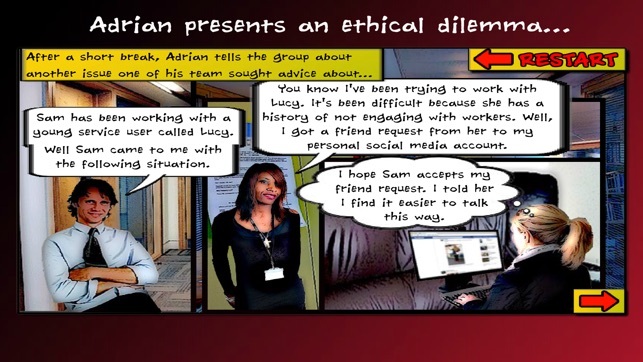 In the app you will meet a Team Manager called Adrian, he will present some ethical dilemmas around social media use. Can you help Adrian make the right decisions to ensure his team’s practices are consistent with social work ethics and values? Based on the issues raised by Adrian, you are encouraged to reflect on your decisions and consider the potential impact these may have on your day-to-day social work practises in relation to social media use. The app uses a games based approach. Therefore, if your advice leads to successful outcomes you will proceed through the scenarios. However, if your advice leads to unsuccessful outcomes for either Adrian’s team, agency or service users, you will have to start from the beginning again. Can you advise Adrian successfully the first time around? The aim of the app is to encourage discussion and debate. As you use the app, try to identify the basis of your advice to Adrian. After using the app on your own, consider working through it with colleagues to explore any differences in decision-making approaches. 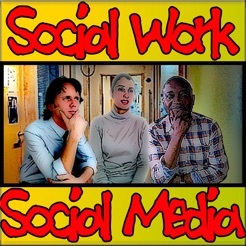 • Is social media skills development important for social workers? • What are the ethical implications of exploring open social media profiles? • Should social workers be mindful of their online image? • Does social media present new personal/professional boundary issues? • How can social workers effectively engage in continuing professional development when using social media? • Can skills, knowledge and confidence in social media use lead to greater service user, community, inter-professional engagement? For educators and trainers, this app can be used as a pre-teaching/training activity. The issues raised can be explored in more depth during online and face-to-face learning events. The app can also be used as a pre-induction resource for social work students to help them examine some of their social media practises before entering a professional programme. Many of the issues raised in this app can also be applied to other professional disciplines. The app can be used as a trigger to develop discussion and debate within wider professional settings. Bug fixes and updated binary. This is an excellent App, stressing the importance of understanding and evaluating the role of social media in the Social Work arena. It has been creatively designed and is very easy to use-highlighting key issues around values and professional/personal boundaries. It has a range of practical applications-i would recommend this App for all Professional Social Workers & Managers and also Students/Educators too. I am very impressed with this app. I found it easy to use and very effective as a learning tool. It requires thought process and decision-making. It has added value with its excellent design interface and graphics including video. I would highly recommend this app. I hope more cases and scenarios are added soon. There is an increasing awareness of the need for advice and guidance for social service staff in relation to using social media and this app allows for that discussion to happen in a safe and controlled environment. This is a well thought out resource for exploring social media uses in the social services sector and is highly recommended for all students, practitioners and managers.